The service changes start this Sunday. Train services throughout West Yorkshire are changing from this Sunday, May 20, affecting Wakefield, Calderdale and Kirklees. • Services between Knottingley and Wakefield Kirkgate are extended via Wakefield Westgate to Leeds – but will not stop at Outwood. • Significant changes to times and service patterns at all stations along this route. • York - Preston services now operates to Huddersfield via Bradford Interchange with earlier journey opportunities between Bradford Interchange and Huddersfield. • Selby - Huddersfield services now operates to Manchester Victoria. • A new Leeds – Preston service is introduced, replacing the York – Preston service but now stop at Sowerby Bridge at all times. Direct trains between Leeds and Blackpool North will only run at weekends. • The Leeds to Manchester Victoria via Dewsbury and Brighouse service, continues to operate Monday to Saturday, but is extended to Southport via Wigan Wallgate. Some trains from Leeds to Sheffield are extended to/from Lincoln. Sunday daytimes - there will be a half-hourly service between Leeds, Harrogate and Knaresborough. The current Horsforth services will be extended to/from Knaresborough. • 0809 Knaresborough to Leeds to depart Knaresborough 3 minutes earlier and call additionally at Pannaland Weeton. • 0756 York to Leeds will call additionally at Pannal. • TransPennine Express (TPE) will now operate 6 trains an hour between Leeds and Manchester via Huddersfield. 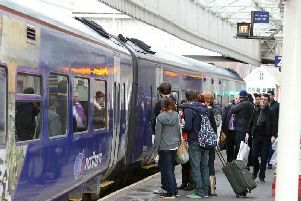 • Leeds – Manchester Piccadilly service will be introduced stopping at most stops along the route taking over 1 hour. This service will also run will hourly on Sundays. • All Manchester Airport services between Huddersfield and Manchester Piccadilly be diverted to serve Manchester Victoria and Manchester Oxford Road. • The Leeds to Manchester Victoria via Brighouse service, continues to operate Monday to Saturday, but is extended to Southport via Wigan Wallgate from Manchester Victoria. • All services now stop at Kirkstall Forge. Last train Monday to Saturday from Huddersfield to Sheffield will leave later at 2251. Most trains between Huddersfield and Sheffield will stop at Elsecar.